With declining costs, solar electricity has become an increasingly affordable option for property owners wishing to power their homes with clean energy. But what options are available for solar energy enthusiasts who have shading problems or roofs that need replacement within the next five years? And is there any path available for renters who want solar but don’t own the roof over their heads? There is an option for La Crosse-area customers of Xcel Energy—every customer now can “plug in” to a community solar garden and reap the benefit of that clean energy directly on their electric bills. With the recent rollout of Xcel’s Solar*Connect Community program, residential and business customers are stepping up to purchase a share in the output through up-front subscriptions that will likely be paid back in full after 20 years. Hopefully, their early action will inspire others in La Crosse and surrounding communities to join in and reap the solar harvest. Grouping thousands of solar panels into one large array lowers the unit cost of the project to participants. Through this structure, every participating utility customer will share equitably in this clean power installation at a low cost. Another segment of the community that benefits from shared solar is the nonprofit sector, which can solicit tax-deductible contributions from its members or donors to become solar buyers. 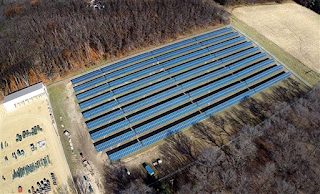 Indeed, community solar is a great way for a benefactor to bestow a clean energy legacy for a particular school, nature center or house of worship. Solar projects like these do not drop out of the sky and magically land in your community. These arrays are going up in western Wisconsin because the people there and utilities such as Xcel believe that their communities are ready to launch the transition to clean energy, and they worked hard to make these projects happen. They also believe that solar is a cost-effective energy option today when customers are given the opportunity to step up and support it. La Crosse-area residents and businesses are fortunate to have this opportunity to take their energy future into their own hands. To Xcel customers living in the area, we at RENEW encourage you to make the most of this opportunity and enroll in your local solar program. There is no clearer way to show the world where you and your community stand on clean energy.